The process of setup generation groups the manufacturing and design operations in setups in terms of the manufacturing experience. That manufacturing experience can be shown like the manufacturing features that are machined by utilizing the same fixtures or jigs and have generally approach directions, and must be classified in the similar setup. This categorization is performed by satisfying as more as possible the constraints the feature of precedence relationships and the tolerance relationships with features. 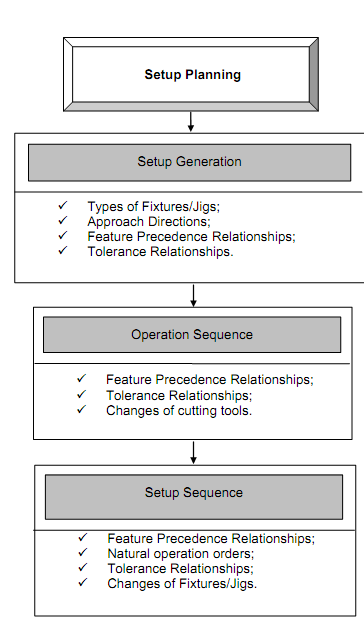 The operation sequence process assembles the operations in all generated setup into the order; hence the constraints of the feature precedence relationships in all tolerance and the setup relationships within all features are highly satisfied. Additionally, this decreases the cutting tool changes in between the operations to a minimum. The setup sequence is to arrange the produced setups into order; hence the constraints of feature precedence relationships, and also the natural operation orders among various setups, and the tolerance relationships in between the features from various setups are maximally satisfied. Moreover, the changes of fixtures or jigs among the consecutive setups are minimized. The whole setup planning activity is thus composed of three steps that is setup generation, operation sequence, and also setup sequence as represented in Figure. The setup generation produces setups, and also the operation sequence puts operations in the order, and the setup sequence at last arranges the generated setups in sequences. In such manner, the setup planning aids in raising the manufacturability of parts and its quality when reducing the costs occupies in its manufacture. The causes for good manufacturability are that the feature precedence relationship and the natural operation order have been determined. The part can be machined also along with low cost and high quality by meeting the need of the tolerance relationship. Moreover, changes can be minimized in the cutting tools in between operations and the fixtures or jigs among setups. Eventually, the objective of low production cost can be realized. Conversely, setup planning encounters complexity in situations where a lot of decisive factors exist. These decisive factors comprises fixtures or jigs, approach manufacturing features directions, feature precedence relationships, tolerance relationships, natural operation orders, and cutting tools. These decisive factors contain multiple and interrelated relationships along with one another. They are often non-commensurate and conflicting. The conflict arises while there is an enhancement to the fitting degree of one decisive factor such is detrimental to such of another, and vice-versa. The non-commensuration is such; these decisive factors can't be compared on the similar scale or unit. Moreover, the relationships in between such decisive factors are generally nonlinear. Hence, setup planning problem can be observed as NP hard. Thus, the efficient approaches application as neural networks are thus strongly adopted and recommended.